Today is our final family day before our baby boy joins us and we become a family of 5. Our first thought was that it might be mice or rats. We were ready to transport them to the woods or dispose of them as humanely as possible. But after a lot of research on babies and the type of nest we observed, and looking at these babies closer, we are thinking that they are baby rabbits. The tails are not long like a mouse and they are almost the size of a nearly full-grown mouse. So, I think we have a little nest of rabbits burrowed on the side of our house. Since their little eyes are still closed, based on what I read, they are not more than a week-week & a half old. I covered the babies back up with the fur/mulch/straw nest to keep them warm, and we will keep an eye on them to make sure their mom is taking care of them. For those of you who have read my previous blogs, you know that we also have a nest of 11 mallard duck eggs by our front porch. And of course, we are expecting our 3rd child any day now! We live on fertile ground--what can I say. :) Meanwhile the momma mallard has been sitting on her eggs, and as long as we don't get too close, she will not scare away as easily as she did before. This is the first picture I have gotten of her that I did not take through the window. Can you see her hidden in the bush? Momma Mallard taking care of her 11 eggs. So, back to our fishing adventure. We took the girls in the backyard to go fishing. We weren't sure what to expect. After the nest incident, Jessie ran up to the store and bought some worms. Abby actually got to where she would hand the worms to Jessie to bait the hook--as long as they weren't too "dirty". She's braver than I am! Curled up with daddy--it was a little chilly out there this morning. Katie was into it at first. 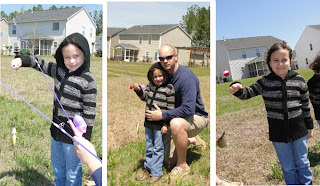 Fishing with their princess rod & reel's. Katie couldn't wait to catch a fish, but once she (or mommy) did catch one, she wanted nothing to do with it. The 2nd one "Katie" caught was huge, for a brim. We threw them all back of course. We did some laundry and cleaning too, while Jessie ran the embroidery machines--finishing up orders that have to go out before the baby comes. Then we ordered pizza, made cookies and watched "Tangled" together. We had such a nice relaxing family day together as our last official day as a family of 4. We are so blessed with the sweetest, most loving little girls. They are going to be the best big sisters! And we know that this little boy will be so loved and just as sweet as his sisters. Abby prayed over the food this evening and added that baby Wesley would not come late. She has made a countdown sheet and daily announces how many days until baby Wesley will be here. They both will kiss and hug the baby (my belly) sporadically throughout the day. We're all pretty excited here on the home-front!